It’s the final day of the month so it must be Foodie Penpal time! 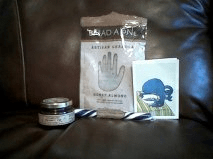 This month I was paired with Gretchen who sent me a whole bunch of goodies (I know that’s a terrible picture above, but I lacked the patience and time to fix it). I had told Gretchen that I am a fan of quality over quantity and that I love to receive things from her area of the country (Ohio). And she really delivered! 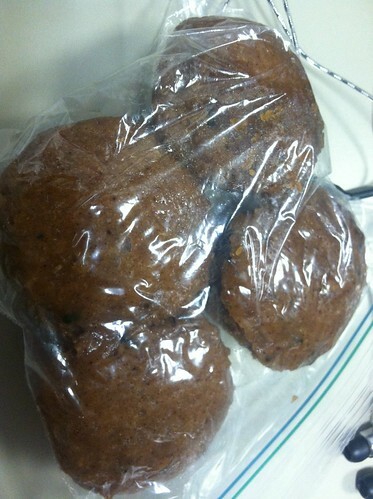 Under the category of really local are these mini zucchini muffins that were delicious! I shared them with my friends and work and they were a big hit. 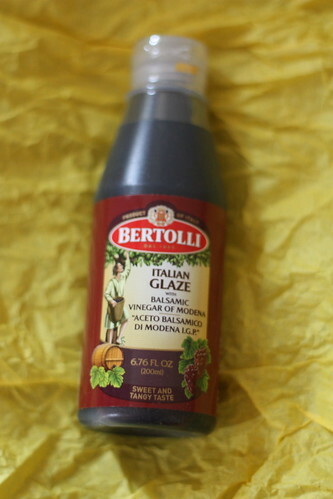 Ok, this Bertolli Balsamic glaze isn’t from Ohio, but it’s still great. I always want to buy a big thing of balsamic vinegar and make glaze, but I never do. So this is perfect. 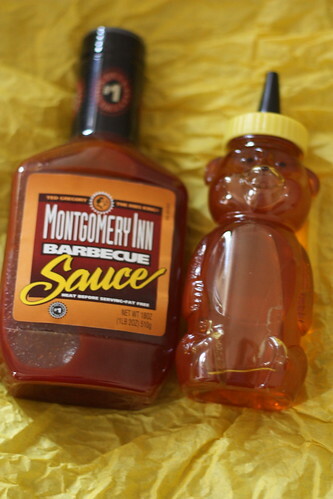 Here is some Montgomery Inn BBQ sauce and some local Ohio honey. 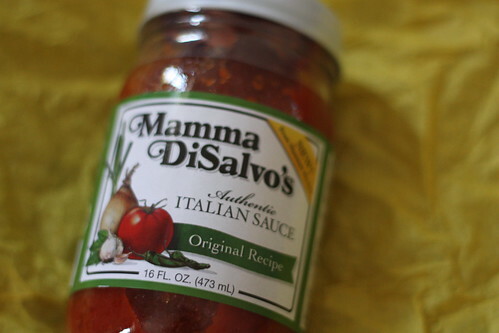 And this tomato sauce which Gretchen says is her family’s favorite. 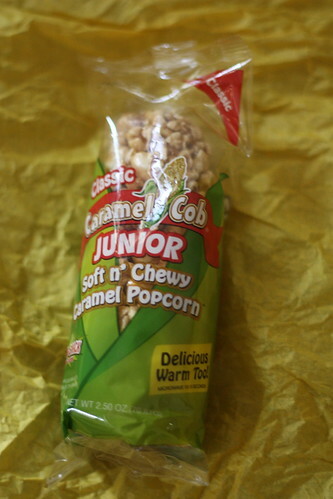 And this classic caramel corn cob treat. I’ve never seen such a thing, but it’s pretty damn brilliant. Unfortunately I’ve been so busy I haven’t had time to try anything. I was going to open the tomato sauce last weekend, but then I thought it would go to waste since I wouldn’t be around all week to finish it. But I can’t wait to try the stuff and thanks so much to Gretchen for so many great things! It feels like a small eternity ago (thank god August is over!) but I played Foodie Penpal to Carrie. I honestly don’t remember what I sent her so I can’t wait to go over to her blog and check it out and you all should too! –Condition 1: You will contact the person you are matched with withing 72 hours of receiving your match to discuss dietary needs, allergies and food preferences. –Condition 2: You will make an effort to meet the dietary needs of your penpal- ie not sending animal products to vegans, dairy products if your match tries to avoid dairy or junk food if they ask for healthy snacks. –Condition 3: You will mail your box by the 15th of the month. It is HIGHLY recommended that you purchase delivery confirmation/get a tracking number for your package. It is very inexpensive and can be used to prove that you sent your package in the event that it gets lost. –Condition 4: In the event that you do not receive a package, Lindsay and The Lean Green Bean blog cannot be held accountable. By agreeing to participate in FPP, we cannot 100% guarantee that you will receive a package. The mail gets lost occasionally and your partner may fail to deliver. -Condition 5: Using the foodie penpals email list to send out personal or spam emails promoting your blog, giveaways, etc is unacceptable and will not be tolerated. Doing so is grounds for immediate dismissal from the program as it is a violation of the other participants’ privacy. You can sign up here. * Note there are now different instructions if you’ve participated the previous month. It’s the last day of July. That means it’s my friend/coworker Erica’s birthday, my uncle’s birthday, and, mostly importantly for our purposes, time to post about Foodie Penpals! I was paired with Jessica, who doesn’t have a blog, but sent me a lovely email and it sounds like she has a great husband and 16-month-old son. She’s currently living in Kansas City and when she mentioned barbecue I knew that was what I wanted! I told Jessica that I’m fine with quality over quantity and I ended up with two great looking things. 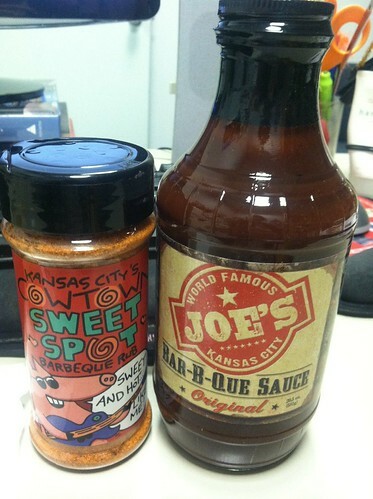 The Kansas City’s Cowtown Sweet Spot Barbeque Rub, looks delicious. And the packaging is great. I’ve never used a barbecue rub so I’m excited to see what I can do with it. 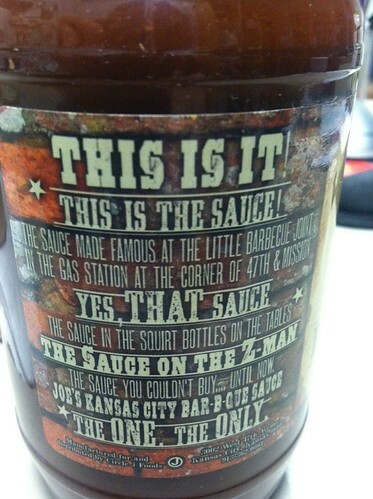 The sauce, World Famous Joe’s Kansas City Bar-B-Que Sauce looks amazing. And after reading the great description on the side of the bottle I really want to go to the little barbecue joint in the gas station. Unfortunately I haven’t been able to use either the sauce or the rub since I’ve had such a crazy past few weeks. I’m excited for the chance though and I’ll make sure to post about what I make! Thank you so much Jessica! I sent my package to Marie, who doesn’t have a blog, and who, in all honesty, I kept meaning to ask if she wanted to write a little thing for here, but I’ve just been too crazy. It happens, right? 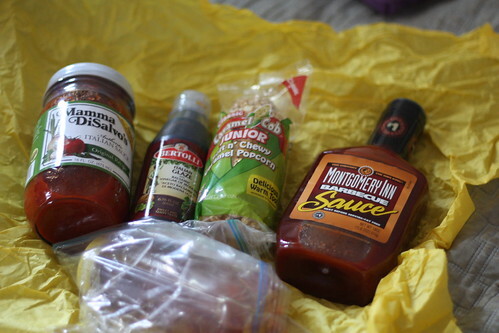 This was my first month participating in Lindsay’s Foodie Penpals exchange and I am so happy I did it! I was paired with Kammie and I got some great stuff! Trader Joe’s pineapple salsa, which I’ve yet to try but it looks delicious. Orange Stevia, which is great, I’ve been wanting to try Stevia so it’s perfect. 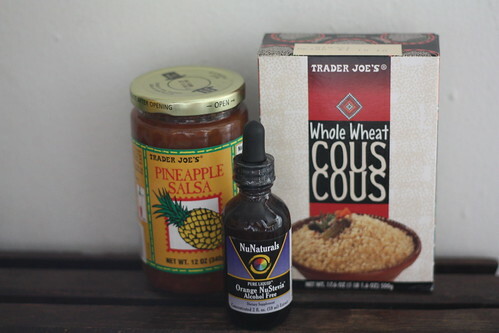 And then Trader Joe’s couscous which I’ll need to make a something with soon. 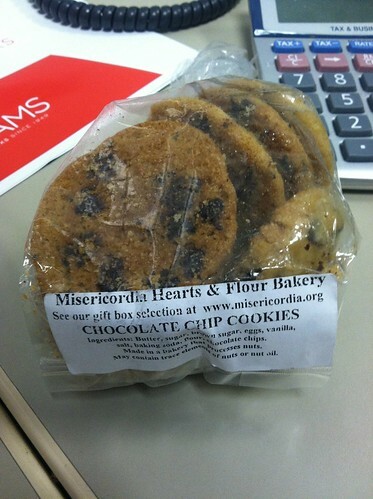 These mini chocolate chip cookies, which were really good, I shared them with my friends in the office. 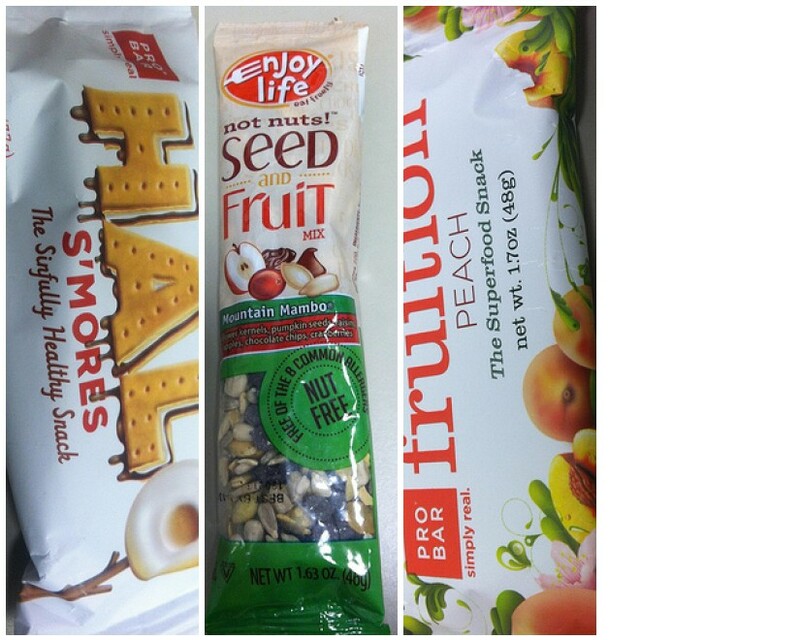 And also 2 bars, a Halo s’mores bar and a Fruition peach bar. I liked them both a lot and I REALLY liked the peach one. Plus I got a package of seeds and nuts which I’ve yet to eat, but looks really good! 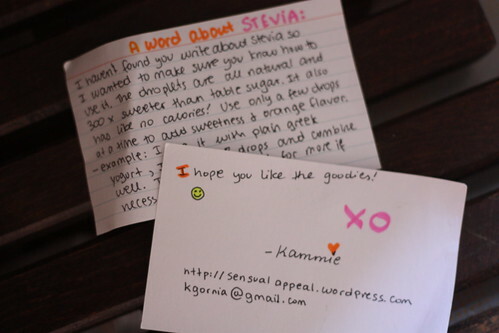 And of course the hand-written note, with a special note about Stevia which was so nice! She also sent a jar of TJ’s speculoos spread which I had been dying to try but never took the plunge to get it. I forgot to take a picture of the jar (oops!) 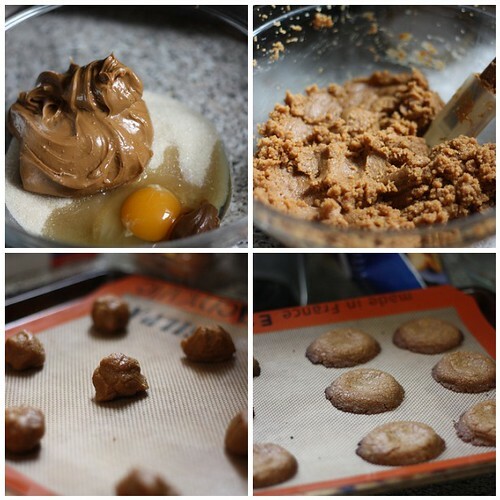 and I’m at my parents’ now, but I did make cookies last week using the spread. I’m so happy I participated. Thanks so much to Kammie for all the great stuff and thanks to Lindsay for organizing! I was paired with Maggie for my first month in Foodie PenPals, and she sent me an awsome box of goodies from New York City. The first thing I noticed in the box when I opened it was a bag of artisan granola from Bread Alone, a local bakery in NYC. I’ve already eaten the whole bag, trying it with milk, yogurt and vanilla ice cream. It was awsome. In my box I also found two items from a store in Booklyn that only sells Brooklyn made items. I got a jar of Strawberry Balsamic Jam from Anarchy in a Jar, which tasted great on my toast for breakfast, and a piece of concord grape hard camdy from BrooklynHardCandy, which I have not had a chance to try yet, but am very excited about. Thank you so much Maggie for sending me a great box of local New York City treats.